The	Board	of	Directors and the employees of the Flathead County Solid Waste District provides environmentally sound and cost-effective refuse collection, disposal and recycling opportunities for Flathead County residents and businesses. 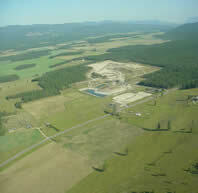 Our facilities are a major part of the economic and environmental infrastructure of Flathead County. Long range planning and fiscal integrity ensures decades of capacity with minimal financial impacts to Flathead County citizens. Total tonnage disposed of at the Flathead County landfill between July 1, 2017 and June 30, 2018 was 144,211 tons, an increase of 24% compared to FY17. In FY18, 83,300 tons of mixed waste was landfilled, of which 51% was disposed of by commercial haulers, 12% by municipal haulers, 8% by private citizens and 29% hauled by FCSW from the container sites. For more detailed information, see our 2018 Solid Waste Report located in the Documents link on the left sidebar. Household recycling is available for cardboard, newspaper & aluminum cans, and are provided at the Landfill, Bigfork, Columbia Falls, Creston, Lakeside and Somers container sites. Kalispell recycling locations are provided by Valley Recycling at their facility. Dedicated cardboard compacting units have been installed at the Landfill, Bigfork, Columbia Falls, Creston, Lakeside and Somers container sites. Items accepted at the Landfill site include: Refuse, construction debris, appliances, used motor oil, batteries, brush and yard waste... as a service to County residences we also retrieve junk vehicles. FCSWD holds a Household Hazardous Waste Collection day on the 3rd Saturday of every month. Click on Documents for a sign-up form or call for for more information. FCSWD offers free pick up and removal of Junk Vehicles within Flathead County. "If you own a vehicle that is unlicensed, inoperative, discarded, dismantled or wrecked ~ State law requires that you remove it from your property, or if you have three vehicles or less, conceal them from public view." Click on Documents for a junk vehicle release form or call for more information.